Archaeologists developed surface survey methods in regions with abundant surface artifacts where these artifacts are visible today because of the action of a variety of geomorphic processes often leading to deflation (see Deflation Archaeology) or due to the concentration of artifacts near the surface. In regions of the Mediterranean, for example, cultivation means that fragmentary ceramics are often abundant and highly visible. Surface survey in the form of “plow zone” archaeology developed accordingly, allowing mapping of the distribution of ceramics as well as other artifact types and features like house mounds. In some regions of Central and North America, good surface visibility led to the development of similar approaches. In other regions, stone artifacts are abundant, and at times hyper-abundant, in surface deposits (Foley and Lahr 2015). In these cases, surface survey strategies have developed to analyze stone artifact distributions. More recently, the advent of technologies capable of detecting features like mounds beneath vegetation cover has enabled archaeologists to undertake surface survey in areas where surface visibility is poor because of vegetation cover. Surface surveys increasingly make use of electronic survey equipment, data loggers, and geographic information system (GIS) software. Two broad strategies characterize surface surveys. Macroscale surveys seek to use the nature and distribution of sites to investigate political and economic relationships that operated over regional scales. These surveys are often based on recording the location, size, and composition of archaeological sites through the use of techniques described as “full-coverage settlement pattern survey.” They make use of recording methods that enable the rapid acquisition of large numbers of records over areas measured in tens to hundreds of square kilometers (Feinman and Nicholas 2013). An alternative approach, named Distributional Archaeology by Ebert (1992) and Off-Site Archaeology by Foley (1981), adopted the artifact rather than the archaeological site as the recording unit. Here methods are used to characterize the differential density of artifacts as well as features across extensive spatial areas without the need to identify site boundaries. However, while the areas considered can be extensive, they are generally smaller than is possible with full-coverage type surveys. Changes in the intensity of field survey correlate with the number of observations recorded. However, increasing survey intensity comes at a cost since the more time spent surveying in one area potentially leads to a smaller spatial extent of coverage. Criticisms leveled at Distributional Archaeology reflected the issues dealing with this relationship (Bettinger 1993), and surveys directed at recording artifact density in the Mediterranean region attracted similar criticisms. Critics commenting on studies from this area complained that some intensive surveys were too small in extent to reveal useful socioeconomic interpretations (e.g., Blanton 2001; Kowalewski 2008). Caraher et al. (2006) summarized the subsequent debates concerning whether a myopia, to use Blanton’s (2001) term, in favor of intensive data collecting led to surveys that covered insufficient spatial extent to identify regional patterns. The ability to conduct surface survey certainly relates to visibility and spatial extent, but the strategies and methods adopted depend on how data acquired during survey are analyzed, and this of course depends on the types of research questions asked. In the following, we consider three broad topics. First, we review examples of surface survey noting the techniques that archaeologists have adopted to characterize surface archaeological remains. We compare studies conducted in the Mediterranean region with those undertaken in both the Mesoamerican highlands and lowlands. Second, we consider methods of analysis applied to these observations. Surface archaeological remains are frequently more abundant than buried remains simply because of their accessibility. It takes more time to excavate material than it does to record material that is visible on the surface. Large numbers of observations from surface deposits make it possible to detect patterns in the distribution of both objects and sites. However, the processes that lead to formation of the archaeological record are often complex and not always directly related to the activities of people. Blanton’s interest in understanding macroscale patterns therefore relies on the ability to define an unambiguous set of analytical procedures that progress from the form and abundance of surface artifacts and features up to inferences about such things as the numbers of people who occupied different parts of the landscape at different times or the nature of hierarchy in social organization. Analytically, it is important to understand the degree to which it is possible to upscale from the distribution of archaeological materials to infer sociocultural process. Third, the quantity of data acquired through surface survey produces logistical challenges but also new opportunities. Using case studies based on our own research, we review the application of new technologies, the use of which means that both the number and the types of observations made have greatly increased. Technological developments also mean that the types of analyses open to archaeologists have also expanded. Archaeological surface survey in the Mediterranean region is now more than three decades old with good consensus on methods used, the types of sampling employed, and the significance of off-site versus site-based survey (Given 2013). In an earlier study, Cherry (2003), for instance, combined probabilistic designs with systematic, pedestrian survey on Melos, Greece, involving surveyors separated by regular intervals, walking across the land surface, recording exposed artifacts. Transect lines 1000 m wide, orientated north-south, were staggered across the island. The typology of artifacts, established through earlier excavations, provided a chronology, while the assessment of the probable function of the artifacts in the field provided an indication of the functional status of the sites identified. In another example, the Troodos Archaeological and Environmental Survey Project (TAESP), archaeologists surveyed an area of 164 km2 broken into six zones that represented different topographic regions. Within these, recording focused on survey units rather than sites. With dimensions of 25 × 50 m, the survey units were spaced in long transects at right angles to the main water courses. Collection involved obtaining a representative sample of pottery, all chipped stone, and a selection of other cultural materials from within these units. Where the identification was made of dense concentrations of material, artifacts were collected across contiguous units (Given 2013). This basic scheme characterized later projects although the intensity of survey (as measured, e.g., by the spacing between field walkers) and the tendency to survey continuous blocks rather than transects changed as did the concern for processes that might have altered or obscured the surface archaeological record (Bintliff 2000). Tataron et al. (2006), for example, reported on the methods used in the Eastern Korinthia Archaeological Survey (EKAS) where investigation involved an area of 350 km2 east of the ancient city of Corinth, Greece. The survey design paid particular attention to the geomorphology of the region including consideration of the postdepositional processes that had a potential impact of the position and preservation of artifacts and features. In advance of the archaeological survey, geomorphologists mapped soils, sediments, and faults at a range of scales, from drainage basins to localized geomorphic units. Use of a GIS enabled the integration of contours, landforms, geology, hydraulics, and tectonics with cultural features like sites, burials, and roads. The survey used a stratified sampling design, with the study area divided into environmental zones initially based on six major drainage systems permitting a regional survey. This allowed the definition of what were termed morphostratigraphic units, landforms reflecting tectonic, alluvial, colluvial, or littoral processes. Within these, survey involved the identification of geomorphic units defined as distinct pieces of the landscape that reflected the action of a single geomorphic process either natural or cultural (e.g., bulldozing). Archaeological survey involving three different approaches made use of these geomorphic units. Initially, survey involved the use of tracts called Discovery Units, where surveyors spaced at 10-m intervals inspected 2-m-wide swaths counting the artifacts they encountered and collecting samples according to a chronotype system (described below). Investigation of these Discovery Units occurred within a selection of environmental strata. In addition to the Discovery Units, Localized Cultural Anomalies provided the means to describe clusters of artifacts and/or features different in extent to the surrounding density of material and where this clustering was not due to geomorphic processes. The third investigation unit, the Extensive Discovery Unit, described areas where it was not possible to implement the intensive, systematic, Discovery Unit approach. The system allowed the integration of geomorphic processes in different parts of the survey area with records of the number and nature of archaeological objects and features. These data in turn permitted assessments of landscape stability, and therefore the depositional history of the artifact surface scatters at a fine spatial scale. Within the Discovery Units, pedestrian surveyors walked 10 m apart counting and collecting artifacts using the chronotype collection system. This system provided both a classification method for artifacts and a collection protocol. Following the system, surveyors picked up one example of all artifacts encountered leaving behind those with the same material, shape, and decoration. Collection involved all items in the case of rarer types such as lithics, metal, and glass. For classification, the seven classes initially identified, pottery, stone/lithics, metal, glass, terracotta, shell/bone, and other, were further subdivided reflecting function and chronology. A separate team considered the artifacts retrieved and conducted further analysis, classifying these and removing any duplicates. According to the authors, the system works well in regions with large quantities of pottery where total collection is not feasible (e.g., Meyer and Gregory 2003; Gregory 2004). Analyses of the data acquired in this way involved calculations of the number of artifacts per area surveyed in relation to environmental data sets collated using GIS software. In Mesoamerica, William Sanders, as part of the Teotihuacan Valley Project, first implemented regional surveys in 1960 with the methods he developed. Sanders expanded the use of these methods to other parts of the Valley of Mexico over the ensuing decade in collaboration with others like Jeffrey Parsons and Richard Blanton. The Valley of Mexico project set the standard for Mesoamerican regional surveys with subsequent surveys extended to the central and southern Mexican highlands (Feinman and Nicholas 2013). For example, survey in highland Oaxaca and the adjacent Mixteca Alta reached a combined area of approximately 8,000 km2. Working in one part of this area, Feinman and Nicholas (2013) reported on the results of a survey of the Ejutla Valley, adjacent to Oaxaca, conducted during the 1980s, before the widespread use of mechanized farming machinery. Vegetation at the time that the survey was undertaken was light, and consequently, the majority of the land surfaces had high visibility, permitting rapid identification of archaeological materials. Survey involved crews systematically walking fields and marking sites identified onto aerial photograph mosaics. It also involved mapping features such as mounds, platforms, plazas, walls, and terraces directly onto the photographs together with their site boundaries. Recording consisted of descriptions of artifact form, frequency, and location, together with datable diagnostic pottery and sherd density. In addition, a series of observations were made concerning contemporary land use and erosion/deposition, as well as environmental variables like distance to water and soil color and texture. In these surveys, less attention was given to the type of fine-scale details related to artifact visibility recorded, for example, by Tartaron and colleagues (2016) working in Eastern Korinthia, Greece. In the surveys like those conducted by Feinman and Nicholas (2013), following the methods developed in the Basin of Mexico, increasing spatial extent provided the primary motivation rather than investment in the extended study of the influence of fine-scale differences in visibility. Stark and Garraty (2008), however, did investigate the impact of visibility conditions on their landscape survey results for the western Lower Papaloapan Basin in the Gulf lowlands of Mexico. They used visibility records to help estimate the number of archaeological features not recorded during survey when considering residential earthen mounds and concentrations of domestic artifacts. Stark and Garraty recorded a variety of vegetation categories and showed how, even in what they referred to as “full-coverage survey,” the area investigated should be considered as a sample, dependent on the size and obtrusiveness of artifacts and features, the intensity of survey coverage, and the variation in visibility across the landscape. Other studies have shown how different processes affect survivorship of the archaeological record and hence its visibility, both at the scale of the archaeological site and at that of the individual artifact (Bintliff 2000; Terrenato 2004). Pottery, for instance, degrades with age, depending to some extent on its manufacture. Therefore, ancient sites may be less visible than those that are more recent. The complexity of the natural processes involved in any one region means that their impact needs consideration on a case-by-case basis. Equally important, some activities in the past led to the deposition of many artifacts, while others produced many fewer objects. Therefore, comparisons require careful consideration of density measures. Varieties of approaches have developed to assess the processes that pattern the surface archaeological record. Some of these relate to cultural behavior in the past, but patterning may also result from natural processes, and different patterns are visible at different spatial scales. Markofsky and Bevan (2012), for example, report on techniques used to assess differential visibility in the Murghan Delta in southeastern Turkmenistan. In this region, alluvial fans result in complex patterns of hydrology and dune cover that complicate interpretations of artifact density. Infrequent heavy rains combined with winds act to deflate sediments and thereby redistribute surface material. Markofsky and Bevan illustrate analyses designed to assess the degree to which ceramic sherd counts show patterning in some directions more than others do (i.e., are anisotropic). Two techniques are used, directional and surface variograms, both of which permit the assessment of spatial variation over multiple distances and in different directions and angular wavelet analysis that permits the analysis of angular variation between individual surface sherds. Within the Murghan region, sand dunes are orientated north-south, while the paleo-delta is orientated northwest, with paleo-channels approximately following this orientation. Visual assessment of these anisotropy were checked using Advanced Spaceborne Thermal Emission and Reflection (ASTER) satellite data with variograms showing the strongest autocorrelation in the directions ranging from N-S to NNW-SSE. Application of the variogram technique enabled assessment of the distribution of ceramic sherds recorded in the study area. The analysis showed anisotropy at distances up to 4–500 m but with considerable local variability. Application of wavelet analysis to pottery assemblages separated chronologically showed change in the nature of anisotropy through time. Bronze Age pottery showed no clear anisotropy in the northern part of the survey area; however, Sasanian and Islamic pottery showed strong east-west anisotropy in the same region. The authors propose that this difference in pattern may relate to a present-day road that might have followed the route of more ancient tracks, perhaps reflecting an east-west trading corridor. Pottery concentrations aligned to this road. In our own work, we have also paid particular attention to the types of geomorphic as well as cultural processes that might have an impact on the visible surface archaeological record. In western New South Wales, Australia, for example, eroded areas termed scalds were formed when the uppermost sediment layer was removed by erosion, exposing the underlying layer which is commonly saline (Fig. 1). A soft, puffy, crust typically forms which readily breaks down with trampling by modern domestic stock (Charman and Murphy 2000). Erosion removes fine sediments but typically leaves the larger clasts intact including stone artifacts. Scalds therefore form physically bounded areas that have high archaeological visibility. In effect, they act as small excavations distributed across the landscape with the majority of the artifactual material remaining in place. Since the scalds formed because of erosion, their location is effectively independent of the activities of the Aboriginal people who were responsible for manufacturing and discarding the artifacts. They therefore form suitable ready-made sampling units with which to investigate large areas. In our survey work, we studied a random sample of the scalds from one drainage feature, Rutherford’s Creek. In each scald, a geomorphologist drew a line separating eroded from intact sediment. Within this perimeter, lines were drawn to indicate patches of soil, vegetation, and ant nests together with any modern activity such as vehicle tracks. As well, the boundaries of any watercourses were marked out (Fig. 2). All lines were digitized by a total station positioned using a differential GPS. Once the digitization of lines was complete, artifacts over 20 mm in maximum clast dimension were identified and described and their locations mapped. In a series of studies, we assessed the impact of these localized geomorphic features on artifact visibility and location (e.g., Fanning and Holdaway 2004), scaling the processes up to account for both the presence and absence of artifacts at different points in the landscape (e.g., Fanning et al. 2009) and to patterns in the chronology of cultural materials (e.g., Davies et al. 2016). Analysis of the pattern created when radiocarbon dates obtained from surface hearths were combined showed that both the increase in the frequency of dates toward the present and oscillations in the number of dates in adjacent periods are likely reflected periods of erosion and burial as a result of episodic rainfall rather than culturally related processes like local population shifts (see Deflation Archaeology). Thus, in the case of western New South Wales, it is possible to show that visibility at the microscale accounts for some of the patterning visible at the macroscale. In such situations, it is important that archaeologists undertake local-scale visibility studies before making cultural inferences from the nature of macroscale patterning. Comparing patterns generated by natural and cultural processes exposes archaeologists to the challenges posed by equifinality (following Dincauze 2000 rather than the strict definition – see Rogers 2000). People certainly created artifacts and features in the past, but the patterns these items form in the archaeological deposits on both the surface and in buried deposits do not necessarily relate solely to past human activities. The way the archaeological record accumulates and is transformed forms patterns in material remains that may at times appear as though they relate to human activity when in fact they relate to geomorphic processes. It is therefore important to understand how processes that affect visibility scale up to have an impact on broad-scale inferences that archaeologists make about things like past settlement patterns, social hierarchies, and population numbers. As studies like those we conducted in Rutherford’s Creek and more generally in western New South Wales, Australia, show, increasing the spatial scale does not always negate the impact of differential visibility. To use Blanton’s analogy, while detailed study of the impact of differential local visibility may appear myopic, such studies must be undertaken since interpreting regional patterns at face value, without considering the impact of local processes, may lead archaeologists to incorrectly interpret regional patterns that relate to natural processes as if they reflected large scale, human behavior. One of the most dramatic examples of the significance of dealing with the impact of differential visibility comes from recent work on surface archaeological remains in lowland regions of Mesoamerica. In some of these areas, dense forest has led to limited opportunities for surface survey and therefore site identification. However, new technology in the form of airborne LiDAR (see Aerial Archaeology) is changing this, since it is now possible to visualize not only larger architectural examples but also quite low features including mounds, terracing, and underground storage units. This new evidence is changing previously held beliefs about the nature and extent of occupation in previously inaccessible areas (Chase et al. 2012). Rosenswig et al. (2013), for example, used LiDAR data to locate 670 mounds in the Soconusco region of southern Mexico. 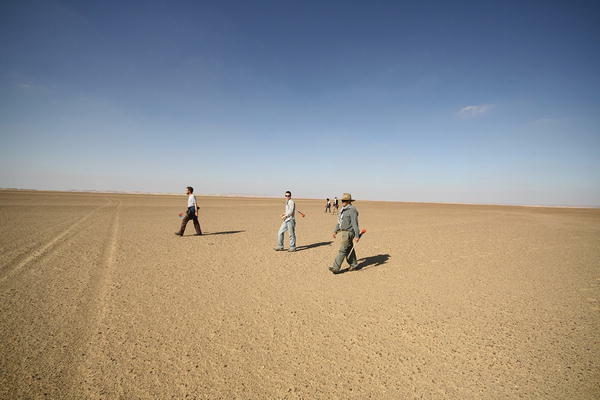 They checked identified mounds using foot survey across an area of 43.1 km2. Based on the correlations obtained comparing LiDAR and conventional survey, size estimates for the area of the site of Izapa utilized during the Late Classic period tripled. In a separate study, Fisher et al. (2016) reported on the archaeological settlement pattern for the Mosquitia region of Honduras. Using airborne LiDAR permitted the detection of anomalies on the surface larger than 1 m on a side and greater than 50 cm height. Results of the LiDAR survey indicated considerable cultural modification of the area in the past with both terraces for agriculture and habitation together with water control features constructed. The identification of 19 settlements was possible in a variety of geographic settings in addition to a single larger site with an area of 142 ha composed of 10 plaza complexes. As with similar studies, discovering the number and extent of features in areas today covered by vegetation is changing previous conceptions of the nature and extent of past settlement patterns. The increase in precision obtainable with LiDAR data is also changing estimates of the numbers of archaeological sites from those based on direct field observation using older technologies like aerial photographs. In a LiDAR study of the Kohala field system, Hawaii Island, for example, Ladefoged et al. (2011) reported how, compared to an earlier study, the use of LiDAR increased estimates of the density of alignments in field systems from 614 m/ha to 850 m/ha. They also reported how the LiDAR data permitted greater understanding of the distribution of alignments than was previously possible, as well as the accurate identification of the relationships between trails and agricultural alignments. As illustrated by Mosquitia study, it is important to understand when archaeological features are truly absent versus those simply hidden from view. However, as some of the other examples also illustrate, it is also important to understand how the distribution of archaeological materials may result from the action of processes other than peoples’ past behavior. In some studies, there is evidence that differential visibility as well as increased accuracy of recording of archaeological features may scale up from the micro to the macro leading to different conclusions about the distribution and complexity of past activities. This indicates that the visibility of the surface archaeological record needs to be carefully analyzed before making inferences about past use of the landscape. Menze and Ur (2012) introduced their study of mound sites from the Upper Khabur Basin of Hassake Province, northeastern Syria, with the observation that survey archaeology involves a trade-off between the need to survey areas extensive enough to discover pattern with the need to survey intensively at the local scale to discover small sites. As they suggested, initially many archaeologists dealt with the first half of this dichotomy, while in more recent times, the latter half has also become of interest. Their solution to resolving the dichotomy is to adopt the use of satellite imagery, which they used to investigate an area in Mesopotamia measuring 22,000 km2. In their study, they focus on the volume of mounds since calculation is possible from a digital elevation model derived from the satellite data. Volume provides a proxy for the long-term attractiveness of settlement locations. They made use of multiple satellite images taken at different times to verify that mounds identified in the images were similar to nearby known archaeological sites and to remove short-term surface variation. When combined, the results from the analysis of multiple satellite images resulted in the identification of 14,312 sites. Verification compared high-resolution Satellite Pour l’Observation de la Terre (SPOT) and Central Intelligence Agency Directorate of Science and Technology (CORONA – a code word not an acronym) satellite image data and with data derived from archaeological surveys in the region. Use of the Shuttle Radar Topography Mission (SRTM) digital elevation model enabled mound volumes to be calculated. Using the number of sites per area, the volume of all sites per area, and the average volume of sites per area, comparisons were made with drainage classification, all three quantities showing a positive correlation. The patterns that Menze and Ur (2012) detected suggest long-term arrangements in the way settlements were located in Mesopotamia. However, as the Markofsky and Bevan (2012) study outlined above shows, macro-regional patterns do not always reflect the actions of people in the past. Processes that lead to differential visibility in the location of archaeological materials but also their size and form can create distributions that look as though they represent past settlement patterns. Simply increasing the spatial scale of observations, as advocated by some (e.g., Kowalewski 2008), does not overcome this problem. Bevan and Conolly (2009) discuss the issues involved in understanding patterns observable at different spatial scales using the concept of the modifiable area unit problem. The “problem” in this concept arises because with aggregated data, observable spatial patterns are dependent on the spatial scale used, and therefore the choice of aggregation unit becomes important in determining the nature of the patterns seen. Where densities of material culture vary, relationships that may be apparent at a particular spatial scale in one area may not be apparent when the scale and/or the area is changed. Bevan and Conolly report on the results of the survey of the entirety of the Greek island of Antikythera. Here they note that two patterns in the distribution of pottery are apparent when measured at different scales. At the local scale, differential pottery density relates to the existence of small, dense areas approximately 100 m across which tend to cluster together with clusters separated by emptier areas. At a regional scale, higher and lower densities align with prevailing tectonic fault lines running in a NW-SE direction. The later pattern also correlates with a number of environmental variables like soils, slope, elevation, and hydrology. Behavioral inferences based on these different patterns need to be carefully made. The choices people made in the past to locate their activities in different places were certainly at times influenced by environmental variables, but these same variables may influence archaeological site visibility, and these two processes need to be carefully considered if they are to be differentiated. Bintliff et al. (2006) discuss examples from survey work in Boeotia, southern Greece. Here patterns of ceramic visibility relate to chronology and sherd survival. In their study, investigation was based on Sherratt’s (1980) suggestions about site distributions as part of his early farming model. According to the Sherratt model, both the secondary products revolution (i.e., the development of dairy and wool production) and olive cultivation provided opportunities for increased agricultural production in southern Greece. However, the results obtained from surface survey produced pottery concentrations from Classical Greek and Roman age sites without such pottery concentrations identified dating from the Neolithic or Early Bronze Age periods. Bintliff et al. (2006) explain this absence by considering both the nature of pottery discarded at different periods and the processes that led to pottery discard. Classical Greek pottery survives well in contemporary plowed soils, whereas Neolithic and Bronze Age potsherds were made from a coarse pottery fabric and therefore have poor survival. As well, during Classical times, large quantities of sherds transported away from Greek cities were included in the manure deposited in fields adjacent to settlements. Within the area surveyed, numbers of these sherds exceed one million. Therefore, they tend to swamp the small number of sherds that survive from earlier periods. Bintliff et al. (2006) note how only small numbers of Bronze Age sherds are present in collections retrieved from areas with dense concentrations of sherds with later dates. They argue, therefore, that surface scatters with small numbers of older aged sherds may today represent early farmsteads, with the sherds found being in poor condition. These sherds provide the evidence for Sherratt’s (1980) early farming. Following this line of argument, Bintliff et al. (2006) modified their strategy when undertaking survey near Tanagra where manuring has also led to the deposition of many sherds from Classical times. Collections were made of all sherds with particular emphasis on the identification of coarse body sherds. Analysis of the resulting distribution indicated a 2-km-long stretch where Neolithic sherds were recovered in an area with perennial streams that conformed to some degree with the predictions from the Sherratt model. In the Ejutla Valley example discussed above, Feinman and Nicholas (2013) estimated population numbers represented by every site following the procedures developed by Sanders and Parsons for the Valley of Mexico survey. The calculations used the assumption that the area of a site and consequently the ceramic density on the site related to the number of people who occupied it. With the addition of mound volume, these measures provided population size estimates organized by temporal phase and geographic location, which in turn provided the means to infer mound and population size hierarchies for each temporal phase. These allowed the consideration of social organizational change through time including the centralization of political power. While analyses of the type used by Feinman and Nicholas (2013) provide the means to investigate macro-regional settlement pattern change, using ceramic typologies to provide chronologies, care is needed in assessing the analytical steps that lead to estimates of past population levels and political complexity. An increase in the frequency of observations through time may appear to show population increase. However, as the Australian hearth example discussed above illustrates, geomorphic processes that determine the burial and exposure of hearths, and therefore the ability to obtain radiocarbon determinations, can create patterns very similar to those that are attributed to population increases when analyzed in some macro-regional studies (Davies et al. 2016). Even if differential visibility can be accounted for, including such things as the survivability of the artifactual material, as Duffy (2015) points out, there are varieties of behavioral causes for distributions of sites that display site size hierarchies that do not involve examples of political centralization. Duffy’s study illustrates some of the issues surrounding equifinality that are of a concern in archaeological interpretation. It is important to consider how the “modifiable unit area problem” discussed above may have an impact on the patterns generated at different spatial scales and therefore the types of explanation that archaeologists derive from surface survey. In our own research in Australia and Egypt, we have confronted the issue of how to assess both the distribution and composition of artifacts recorded in the sampling units in ways that reflect some of the issues discussed above. At Rutherford’s Creek, western New South Wales, Australia, for example, the composition of the artifact assemblages in the scald sampling units recorded from the headwaters of Rutherford’s Creek to where it discharges into Peery Lake showed variability in artifact density but not in a way that aligned with the length of the creek line (Holdaway et al. 2012, 2015). Instead, analytical results related variability in density to two processes, one linked to the nature of environmental change and the other being a result of human behavior. Artifacts accumulated on surfaces along the valley floor of Rutherford’s Creek and were visible following erosion, enhanced in recent times by the presence of European introduced domestic livestock that created the scalds used as sampling units discussed above. However, analysis of the surface area and volume of the stone artifacts recorded throughout the length of the valley indicated that a considerable proportion of the flakes originally struck from locally available cores were missing (Douglass et al. 2008). These flakes, likely selected for their size, were transported over distances, and therefore for periods representing their useable life, of such a magnitude to ensure that they were never returned. Transport in this way acted as a proxy for human movement. The stone artifact assemblages that remained reflected assemblages of objects left behind after flake removal. Items carried away indicated those artifacts deemed to be useful for activities conducted elsewhere in the wider landscape. Obviously in this situation, using counts of the artifacts that remained, or the degree to which they were concentrated or dispersed, as a measure of the intensity of occupation or the size of the population that occupied a location would not be wise. The artifacts that remained represented only a sample of those manufactured, and indeed, many of the retouched tools found abandoned by people as they moved through the valley deposited at the end of their uselife may have been made and used at locations well away from Rutherford’s Creek (Douglass et al. 2017). In understanding how to analyze the relationship between the surface artifact distributions we recovered from Rutherford’s Creek in relation to aspects of the environment, attention focused on both manufacture and the processes that led to their visibility. Understanding of the patterns in the spatial distribution of artifacts identified through surface survey in this case study derives from what is missing as well as what is present. Similarly, the environmental context needs to be interpreted in relation to the outcome of a series of processes operating through time rather than a constant state. Analysis of satellite data, SRTM and Landsat Enhanced Thematic Mapper (ETM), provided measures of the topographic complexity of the study area as well as contemporary variability in vegetation and regolith. These data sets, in combination with past and present environmental assessments (Holdaway et al. 2013), indicated the context of past environmental resource abundance. In western New South Wales, resource heterogeneity did not translate into the formation of regularly recurring resource patches, largely because of low soil fertility combined with climatic variability. Australia is characterized as having an “infertile, well sorted landscape” (Stafford Smith and Morton 1990: 261). Long periods with little or no rain separate short periods of very abrupt rainfall. At the same time, Australian soils are depleted in nitrogen and phosphorous, largely because of the continent’s tectonic history (Morton et al. 2011: 317). Lack of fertility and intermittent rainfall thus combined to produce a landscape that varies both spatially but also temporally in ways that were not easy to predict. This lack of predictability in environmental resource heterogeneity meant that a location rich in resources at one moment in time might become depleted at another, with little way of predicting when such a change might occur. If resources were episodic in their availability, both spatially and temporally, many places would see at least some use and therefore would see the creation of an archaeological record. Using a “dots on maps” approach, where the location and abundance of past activity are interpreted directly from survey results, the landscape would appear to consist of a carpet of occupation debris, as though all places were used at once. In fact, the opposite is the case; this carpet of dots is instead a signature of high mobility by small numbers of people in a landscape where the ecology and topography lead to the wide dispersal of the material remains of occupation. Image analysis gives the wider landscape context to the archaeological record from Rutherford’s Creek. The low redundancy in place use, as evidenced by the variety of ages and the abundance of hearths, indicates how multiple places saw use, but no one place at levels significantly higher than its neighbor. Similarities in assemblage composition also indicate low redundancy in place use. Analysis of the stone artifacts indicates movement through flake removal, suggesting high mobility consistent with the need to move often, and far, to find the resources that became available through time, rather than the prolonged used of residential occupation sites. In a different study, we considered the evidence for movement in the composition of artifact assemblages from the Fayum, Egypt. The Fayum consists of a depression with a lake, Lake Qarun, and the near lake-edge surrounding environment. Caton-Thompson and Gardner (1934) made the Fayum famous because of their work during the 1920s close to Lake Qarun’s northern shore. They discovered a record of both stratified and surface sites, the latter consisting of extensive distributions of stone artifacts, ceramic sherds, animal bones, and hearths. However, their publications described the stratified deposits, with only a brief description of the composition of some of the surface scatters. Most recently the area was reinvestigated by the University of California, Rijksuniversiteit Groningen, University of Auckland (URU) Fayum Project (Holdaway and Wendrich 2017). The project extended approximately 20 km along the north Fayum lakeshore with an area of circa 142 km2. While some new excavation occurred, one of the main objectives was to survey and understand the distribution of surface material away from stratified deposits. Also investigated was the potential relationship between the nature and extent of settlement and the extent of Lake Qarun that fluctuated in size in the past during the early and middle Holocene. Caton-Thompson and Gardner identified six basins along the north shore with these incorporated into the survey design. Assessment of the size and extent of these basins was made using data from the ASTER global digital elevation map and a 1 m resolution digital elevation model generated from satellite-derived Worldview-2 stereo imagery (Phillipps et al. 2016). To determine changes in assemblage composition and density away from the basins and the paleoshoreline, four corridors were surveyed orientated north-south from the Lake Qarun paleoshoreline. These corridors were 100 m wide and were walked by surveyors spaced 10 m apart. Survey along the corridors enabled hearths and grinding stones to be located using differential GPS. In addition, detailed survey for portable material culture was made using transect survey units located using a logarithmic scale at 100 m, 200 m, 400 m, 800 m, 1600 m, 3200 m, and 6400 m north from the paleoshoreline (Figs. 3 and 4). Survey transects consisted of a cross, 10 m wide with four arms 50 m long, orientated north-south, east-west. Transect units were recorded in two ways. 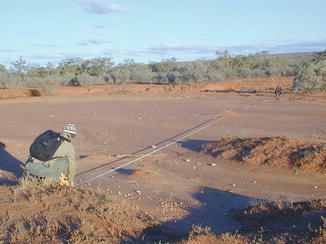 Following a similar method to that employed with the eroded scalds described above in the Australian case study, different sediment types and areas of surface disturbance were initially drawn on the surface and subsequently recorded with a total station positioned with coordinates derived from a differential GPS. Second, every artifact within the transects with a maximum dimension size over 20 mm was recorded in position. To investigate the potential issues related to visibility and preservation, the differential densities of artifacts were calculated for each surface type and for each transect. Results indicated that artifact densities varied considerably according to sediment type. Windblown sand, for example, covered artifacts thereby reducing artifact densities. For this reason, artifact densities from high-visibility surfaces (e.g., consolidated sand and gravel surfaces) were used to compare artifact densities within transects in each of the corridors. Many transects contained either none or very few artifacts, even accounting for surface type. This showed that taking account of differential visibility, artifacts were concentrated near the lake basins originally identified by Caton-Thompson and Gardner. Transects were also used to survey areas close to the K, L, and X Basins (Fig. 5) (Holdaway and Wendrich 2017). In these areas, transects were spaced around the basins and stratified deposits, such as Kom W, forming a systematic grid with additional transects used to survey areas of artifact concentration. Similar patterns of artifact visibility were observed based on mapping sediment types within the cross-shaped transects. After mapping sediment types and artifact locations, artifacts from sample transects were fully analyzed. Data loggers in the form of portable computers enabled recording of the size, shape, and technological variables on all artifacts with a maximum dimension of 20 mm or more. Once recorded, artifacts were returned to the place from where they were found, a practice used in other projects (e.g., Tartaron et al. 2006). Treating artifacts in this way has obvious positive heritage management implications since the archaeological record remains for others to study in the future but also has significant logistical advantages since there is no need to curate large artifact samples (Fig. 6). However, recording in this way is very dependent on technology with a combination of raid and precise surveying equipment to locate artifacts and portable data loggers with which to record observations about the artifacts. The other key technology is GIS software that enables the organization, display, and analysis of multiple types of data (from satellite imagery and elevation models to artifact dimensions and material source data). This software has greatly enhanced the ability to move seamlessly between the scale involved in assessing local visibility and the scale needed for regional environmental reconstruction. Stone artifacts dominated the Fayum assemblages recorded with the majority manufactured from flint. This material does not occur naturally in the Fayum Basin, indicating the movement of raw material for flaking into the area from elsewhere. Like the stone artifacts from surface deposits in Australia, measurements of stone surface area and volume indicated the movement of stone artifacts into, within, and away from the Fayum Basin. When combined with the results of the analyses of pottery, faunal, and floral material, movement, possibly on a seasonal basis, is indicated in the Fayum, following a settlement pattern like that which Wengrow (2006) characterized as a horizontal tell, rather than prolonged occupation of individual villages. Surface archaeological deposits have the potential to answer questions concerning how people used space in the past providing the data needed to answer the types of research questions, for example, posed by landscape archaeology. However, the same exposure that provides archaeologists with access to extended spatial distributions of artifacts without the need to undertake time-consuming excavation has also encouraged methods that are spatially extensive rather than locally intensive. Artifacts often show pattern at different spatial scales leading to the problems posed by equifinality as well as issues connected with the modifiable area unit problem. There are multiple processes that lead to objects showing spatial patterning, and while some of these relate directly to human behavior, others relate instead to the operation of natural processes or indeed to some combination of the two. While it is often tempting to look for the types of broad-scale pattern that suggest potential inferences about past population levels, social complexity, and occupation duration, it is often not possible to assume that an increase in spatial scale will offset pattern induced by differential visibility caused by natural processes. The number of studies that document the alteration of the visibility of surface archaeological deposits (or indeed buried deposits) by non-cultural processes indicates that claims of myopia when studies concentrate on documenting the local impact of artifact visibility may be misplaced. Dealing with spatially extensive surface deposits involves the integration of many forms of data making the application of GIS increasingly fundamental in surface survey. To some degree, these same software systems are helping to overcome the perceived dichotomy between spatially extensive and locally intensive survey (McCoy and Ladefoged 2009). When combined with modern survey equipment, like GPS and total stations but also portable data loggers, it is now possible to record rapidly a wide range of information. Moreover, with GIS it is also possible to move seamlessly from the local to the regional spatial scales. Adding satellite and LiDAR data to the mix, it is also possible to acquire regional data sets including in some instances data that was previously irretrievable because of dense vegetation. These technologies mean that there is much less need to see study at the local scale as achievable only at the expense of the macroscale. Archaeologists have the potential to gain the best from both scales although of course this means they need to acquire multi-scale data. As the examples and case studies discussed here help to illustrate, at worst the issues raised by equifinality and the modifiable area unit problem can be better defined, and at best they can be solved. Ultimately, this will lead to better answers to the interesting questions that archaeologists ask about the past, how settlement patterns varied through time in relation to changing socio-economies and social relations. Surface archaeological deposits are abundant in many regions of the world, and with advances in survey and recording technology, their potential to inform about the past has only just begun to be realized.